Apple has started a new campaign titled ‘Start Something New‘ on its websites across the globe, including the U.S., Europe and Asia, in an effort to showcase and highlight its latest products and various apps used to create unique art and photos. As noted by MacRumors, the campaign debuted on Apple’s Japanese website a couple of days back and now, it is expanding to other countries as well. The new webpage highlights the iPhone 6, iPhone 6 Plus, iPad Air 2 and iMac, while the apps featured on the page include Procreate, VSCO Cam and iDraw. 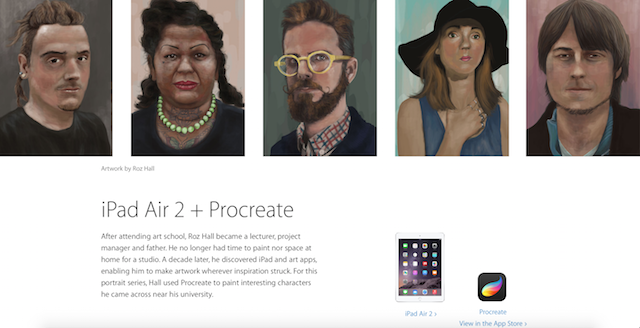 Apple has also included entries on individuals like digital artist Roz Hall, media artist Matt Pyke and art duo Craig & Karl. At the same time, the Cupertino company has also highlighted a number of its own software features, including exposure control on the iPhone 6 and burst mode on the iPad Air 2. You can check out the entire section on Apple’s Canadian website at this link.